BALTIMORE — After a meeting with most of Catherine Pugh's cabinet, now acting Mayor Jack Young had one overarching message for the City of Baltimore. “Let them know the city is stable and moving forward and the work is just beginning,” Young said. And there is much to do despite Pugh. As President of the Baltimore City Council, Young assumed the role of mayor when Pugh announced she would take a leave of absence while suffering from pneumonia . Pugh is also in the midst of a controversy involving $500,000 worth of copies of her “Healthy Holly” children’s book purchased by the University of Maryland Medical System with the stated goal of donating them to city school children. The school district said it lacks records to account for the vast majority of books supposedly delivered to schools . Young inherits a full plate of issues to tackle. He referenced his long tenure in the city as a reservoir of experience to fall back on in his new position. It is budget season for one, and a violent crime rate that continues to surge higher by double digit percentage points over last year. Young says, not to worry. “You have to learn how to multi-task and you have to be able to trust your people who surround you, your department heads and my council people. This is a partnership. This is not just about Jack Young. This is about all of us because we all live in this city and we all want to keep this city moving,” the ex officio mayor said. 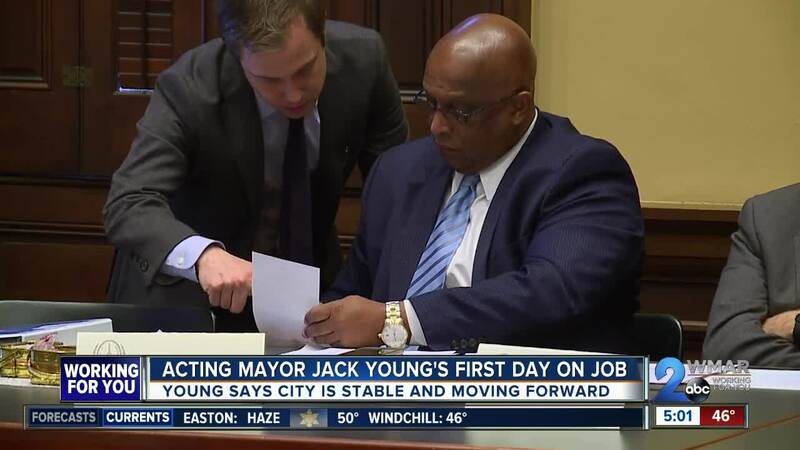 Young emphasized his caretaker role as acting mayor. When asked whether Pugh should resign, he yielded to the state investigation to hash that out. He did say this morning in Annapolis, though, that he would not run for mayor. He would rather still seek the seat as President of the City Council in 2020. In the meantime, council members say critical services cannot be interrupted. Ditto, says Councilman Brandon Scott who says there is work to do. “We cannot allow the agencies to wither away or get side-tracked with this. We are going to hold them accountable because the city demands their leaders show that somebody is still paying attention and we have to do that. Do you think she should resign? I think that this issue has to be resolved permanently very quickly,” answered Scott. Scott, too, is yielding to the investigation by the state prosecutor. But if Catherine Pugh does resign, Jack Young would become mayor through December 2020 and the council would have to elect a new Council President. There is precedent for all of this and from not so long ago, when Mayor Sheila Dixon was convicted, resigned and replaced by Stephanie Rawlings-Blake. Still, in a room off the council chamber on Tuesday, with Baltimore's current power structure all in one place, the message was — back to work.